Yeah Jamey Johnson likes to play the tough guy, making you think he chugs motor oil and eats used tires as the honorably discharged Marine corporeal whose now the big and burly face of traditional country music for many. 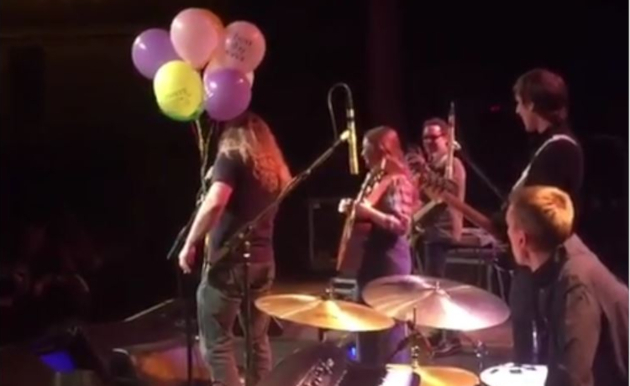 But he showed a softer side at a recent concert at the Egyptian Room in Indianapolis on Thursday, March 28th when he walked out on stage unexpectedly during the opening set holding a bunch of pastel-colored balloons. What was the occasion? It was the birthday of his opening act, Kentucky songwriter and performer Kelsey Waldon, who has been on tour with Johnson as part of his current SiriusXM Outlaw tour. Johnson chose to feature Kelsey Waldon and Erin Enderlin as openers on select dates, and they’ve seen some big opportunities opening for the CMA-awarded songwriter. “Today is Ms. Waldon’s birthday,” Johnson said in his thick Alabama accent after walking on stage to loud applause, holding the balloons. He then led the crowd in an impromptu rendition of “Happy Birthday” in Waldon’s honor. Waldon joined Johnson on tour in February for a run of shows in Florida, and just recently met back up for multiple shows on the east coast (see dates below). Kelsey Waldon is originally from Monkey’s Eyebrow, Kentucky. Yes, it’s a real place in the western part of the state, near the Ohio River. Kelsey’s family farmed tobacco and raised cattle, and the stories of struggle from of America’s rural heartland still drip from her songs. Her 2016 effort, I’ve Got A Way was a slyly thematic work that found Waldon asserting her own identity and freedom in a world that is attempting to reshape and sway her towards its own image and desires. She released her debut album The Goldmine in 2014, and is a favorite among many traditional country fans, and fans of strong songwriters. Another year round the sun. Thanks to @jameyjohnsonofficial & his crew, @sewclarasue and my amazing band @mikekhalilmusic, @alec_newnam & @feltydrums18 for making me feel so loved today. These days I’m feelin like everyday’s my birthday. Thanks for all the wishes and all the love!! He treated her well in Detroit last night, bringing her out to duet with him on Paradise, and then again for the closing medley. Seems like that is all we get from him. But it will have to do. Snapped her two records right up. Nice pickin’ in that band, too. Bone stock country. Saw Jamey in Jacksonville back in February and she opened and did a great job. He brought her out again for a gospel medley at the end. I’m from Jacksonville too, and also named Rob. Are you me? I don’t think I’m you, but you might be me. I’m not from Jacksonville, I’m from closer to Gainesville, I just went to that concert. I guess you’re not me then. That’s too bad. Goldmine and I’ve Got a Way are both great, honest, true country albums. Wish she’d get on over to the west coast more often.